In the month of #MentalHealthAwareness, let us talk about chronic illness, both visible and invisible in relation to depression. For anyone diagnosed with a chronic illness, they have experienced those very low moments in one’s life that sometimes make you wish you would peacefully sleep to the next bearable world. Where tears flow internally and externally with every moment. Sometimes they are short lived, other time they last a long long while. There is a lot of ‘stay positive’ words that are supposed to be one’s mantra and living mentally but let’s face it, it’s never that easy. A chronic illness is not something that goes off after a few days of medication. This is something that is here to stay, changing your complete lifestyle and view of life. It completes isolates you from friends and even family as most people can’t understand why you aren’t getting any better or why you no longer do what you used to do. The lack of want to know from those close to you isolates you further. You keep thinking of all the medication you have to keep taking and still it does not return you to the 100% you knew and functioning to well. You go to the doctor only to be told that the condition has increased despite your change of lifestyle and a cocktail of medication. Or the doctor recommends a procedure that you definitely cannot afford and due to your illness you can no longer work as hard to get the money for insurance. A chronic illness makes one feel like someone is sucking the life out of you and all the negativity brought by the illness leads to more low moments in one’s life leading to depression. Depression does make the illness worse both physically and mentally. Below are extract from sites that show the correlation of the two. For millions of people, chronic illnesses and depression are facts of life. A chronic illness is a condition that lasts for a very long time and usually cannot be cured completely, although some illnesses can be controlled or managed through lifestyle (diet and exercise) and certain medications. Many people with these illnesses become depressed. In fact, depression is one of the most common complications of chronic illness. It’s estimated that up to one-third of people with a serious medical condition have symptoms of depression. People diagnosed with chronic illnesses must adjust to the demands of the illness itself, as well as to the treatments for their condition. The illness may affect a person’s mobility and independence, and change the way a person lives, sees him or herself, and/or relates to others. For these reasons, a certain amount of despair and sadness is normal. 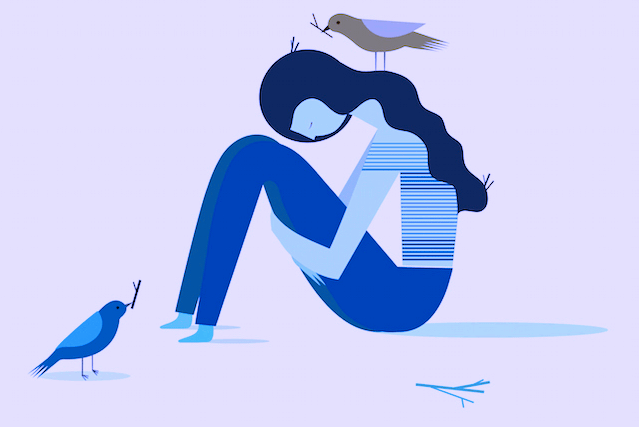 In some cases, a chronic illness may actually cause depression. First and foremost, accept your condition, as hard as it may, accept, learn your limitation. Your experience is different from the next person so don’t compare their achievements or limitations to yours. If you have a chronic illness, do a lot of research on your condition. Information is key. Know the causes and triggers; learn of lifestyle changes that improve the conditions. Be proactive. Always be informed. If you are living with a chronic illness, reach out to someone else who is living with one, find a support group of people who understand your pain and frustrations, let it out, all your anger and tears. Letting out the feelings helps some. Talk to a stranger. Learn how to manage the overwhelming emotions that come with a lifelong condition. Every morning whether you are feeling like giving up or not, read a positive quote, say a prayer. Take a notebook and make a note of targets you can accomplish no matter how small it is. For those with brain fog, you know how important a notebook is. Tick every time you accomplish something even if it’s one, its one thing accomplished than yesterday and be proud of it as only you know how much your pace is. On the same notebook, write an appreciation of the day. What have you appreciated for having seen this day? Is it seeing a smile on your child’s face? Is it being able to get up and see the sunrise or sunset? Whatever it is, write your appreciation of the day. Focus your energy on what you consider a priority and through writing in your notebook, you plan your day. If you know someone living with a chronic illness, it’s not their fault, be patient, be understanding, be there. Most importantly if you are living with a chronic illness, talk to your doctor about how you feel about having the illness, your mental and emotional state in relation to your illness. Your doctor should help you detect depression and together you will work on how to work on it.